You spent a lot of time crafting the perfect gift for that someone special. You know that presentation is important so don’t settle for just any wrapping paper. 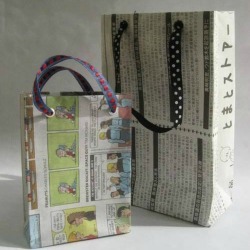 Rackycoo shares her tutorial for whimsical Gift Bags from Newspaper that takes recycling to a new level. These bags can also be used to tote your lunch or store your craft items. Once you have this technique down, try it with other papers and materials. Recycle, reuse and revamp old items into something new with inspiration from our Tutorial Cloud. Be daring! Try a different craft this Tuesday!